Today we have Jen from A Place To Call Home. 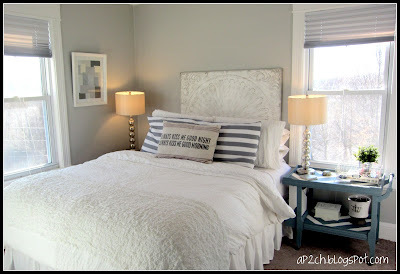 Jen has an amazing style, I found her blog when I saw a picture of her master bedroom and fell in love! I love the calm colours and stripes. 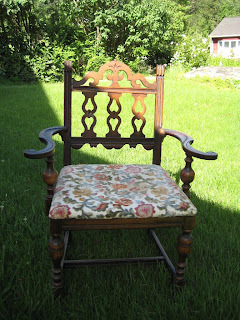 And just look at this chair she made over! I'm here to talk to about Real Vs Ideal in our homes. 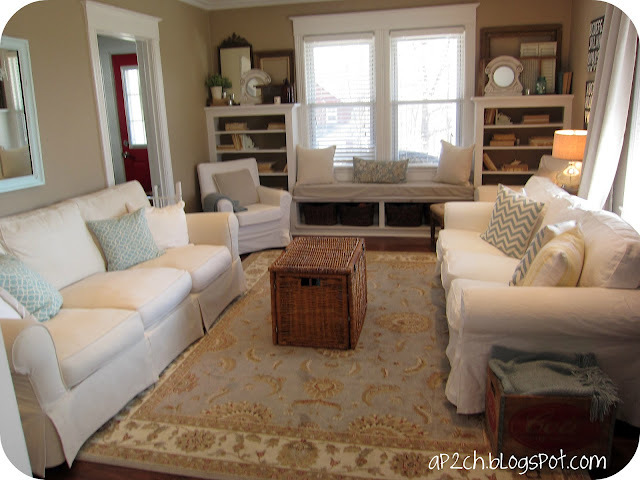 Home bloggers obviously want to show the pretty side of our homes. We may show some ugliness along the way, but for the most part we are showing DIY projects, room makeovers, and amazing pictures from other bloggers or pinterest that inspire us, because the hope is that we inspire you. Because our work is shown online, it pushes us to do better, work harder, and be more creative, however people can be left feeling less than. Wondering "Why isn't my house always perfect?" Well no ones home is perfect, not even mine. During a project, my home is anything but ideal. The truth is real living happens and life is messy. 5. If you forget to put it away, make sure you return everything to there home every night so you start out fresh the next day. My home is real. 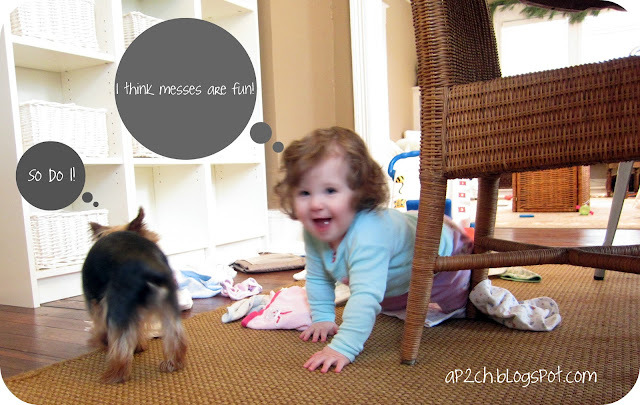 We use it, we get it dirty, we make messes and then we clean them up. We use our living room and dining room all day long. I have storage all over the place and it takes me 3 minutes to go from baby toy disaster to tidied up. This video shows how I can clean up my daughters mess really quickly. I hope you enjoy! 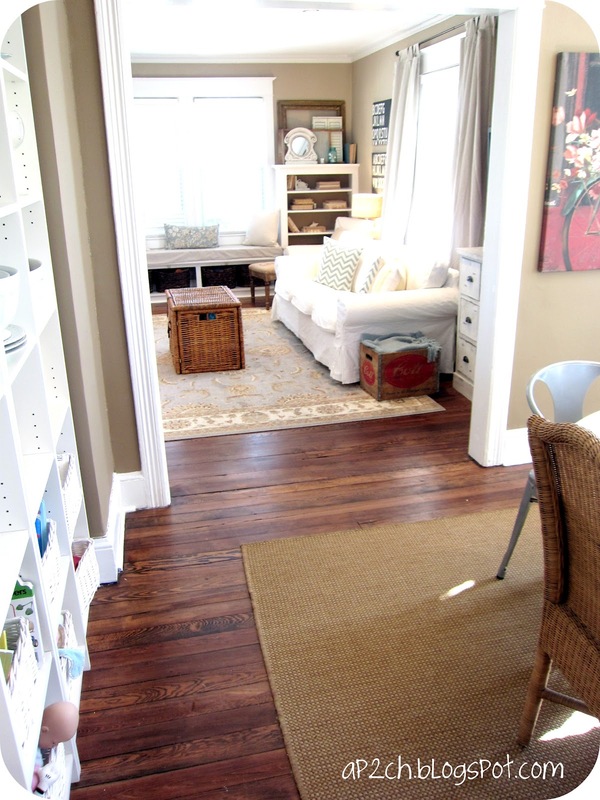 I do hope you'll come over to my blog and check out some of my posts on cleaning , organizing or decorating. Here's my post about Toy Storage. Wasn't that great? I LOVE that she not only gave us some great before and afters, but also showed how she does it so quickly! Come back tomorrow for some more amazing guest posters! 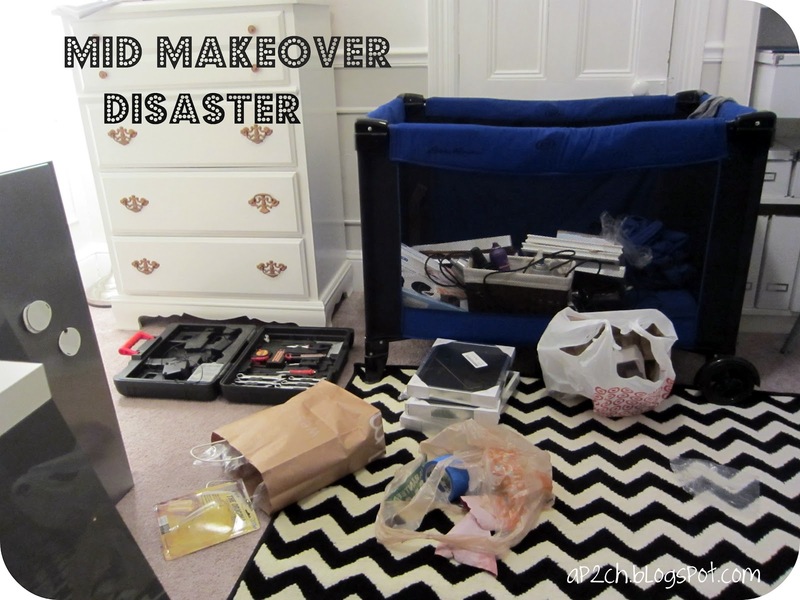 And if you missed yesterday's guest poster, click here to see Jileen from The Overhaul's post. 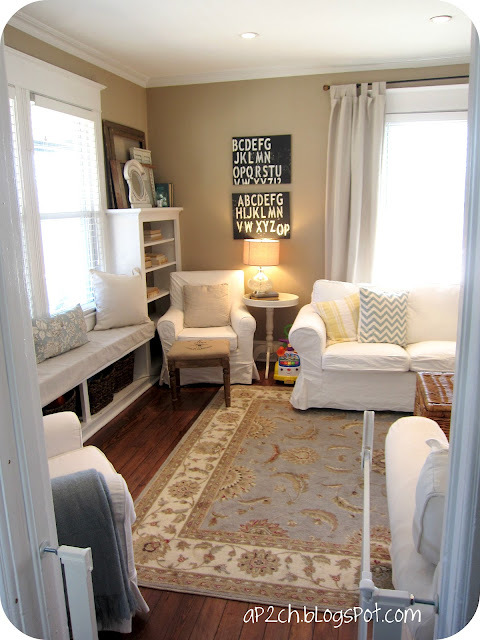 I love Jen's home too, so awesome guest post. I think the best blogs are the real life blogs. With a family, my home becomes a disaster too, but I agree 100%, everything needs a home and it makes it that much easier to clean up. Thanks for sharing. Love the hidden storage! Perfect for hiding the little one's toys now and other things later! It was so cute to see you on video! I loved it. 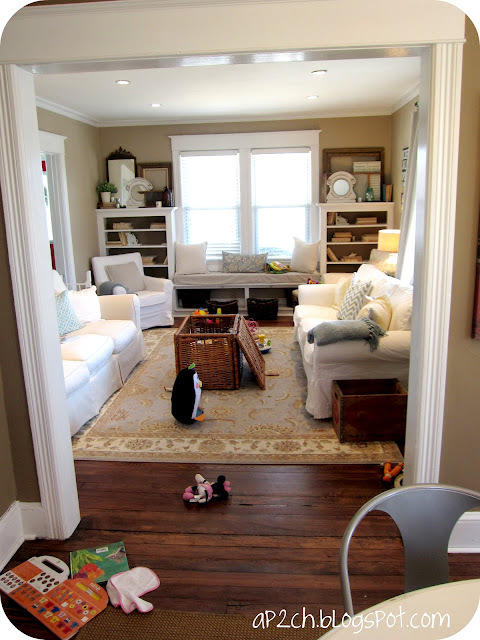 Your house is so practical and pretty, thanks for sharing! Thanks everyone! You are all too sweet! Love the organization and also he messes. It looks like a home is when people live in them. 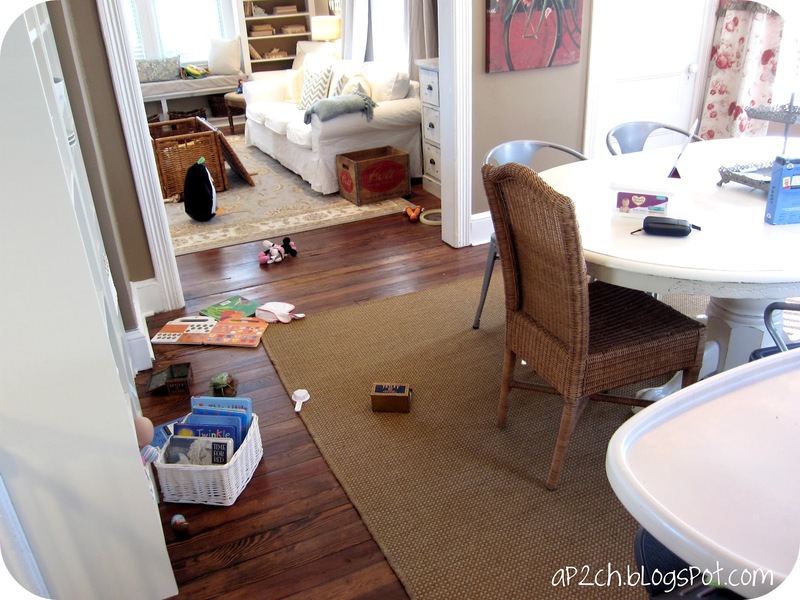 yep...when our kids were little I had storage baskets for all their toys under all the tables. Now those same baskets are used to organize all the winter stuff in the basement...hats, gloves, scarfs...the baskets are a greg idea for kids! 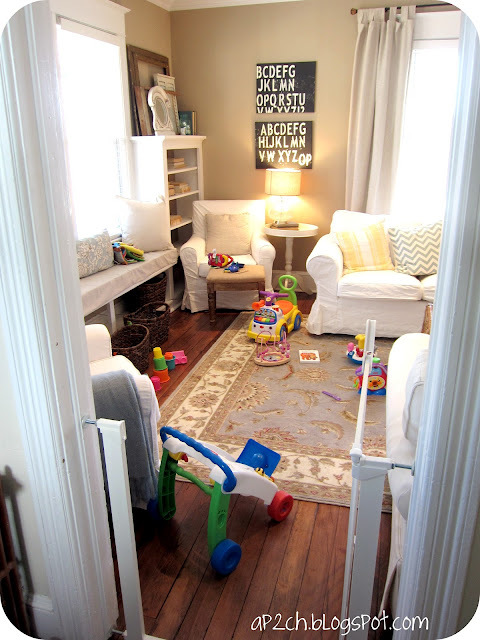 Great guest post from the lovely Jen who has a gorgeous home ! love this series! Totally makes me feel so much better about the dishes in my sink right now. I love all the white in the room, very pretty!